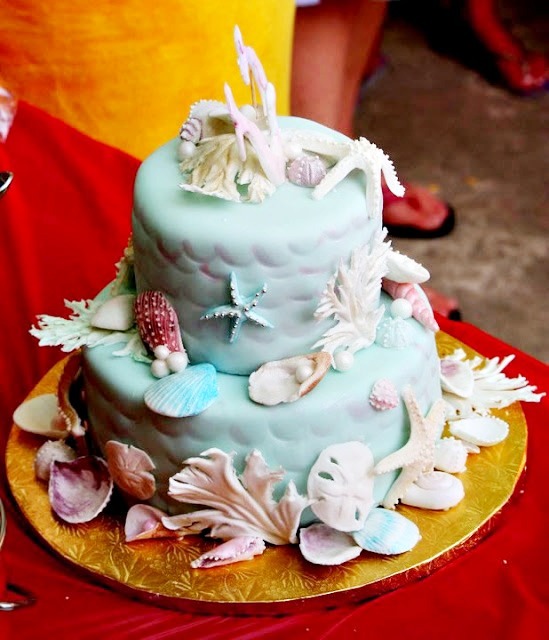 A sea blue (nearly Tiffany blue) cake covered with sea shells and sea things. 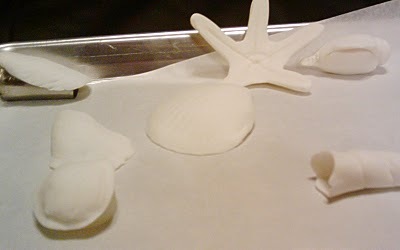 I started by hand-making the sea creatures out of gum paste. I left them to dry overnight, and the next day I hand-painted and decorated them. I love this part of the project! Making all these things out of my imagination, trying to make them beautiful and realistic at the same time. Oh, right, and edible too, haha! Starfish, sea urchins, shells, sand dollars, oysters, sea weed, snails, and pearls! 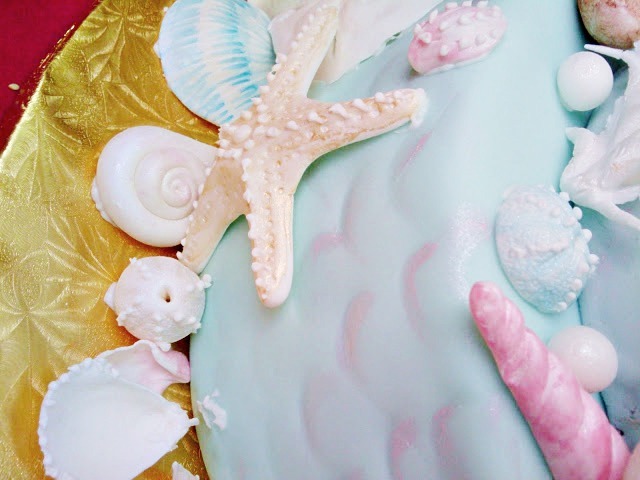 All made with gum paste or fondant, colored with edible pearl dust and royal icing to finish the details. Oh, and my first rule of cake making is that if it doesn't taste good, nothing else matters. Take your nasty cake and go home--this tasty cake got to go to the party. Midnight chocolate cake with mint chocolate ganache filling. Yes, please. I think it turned out beautifully, don't you? 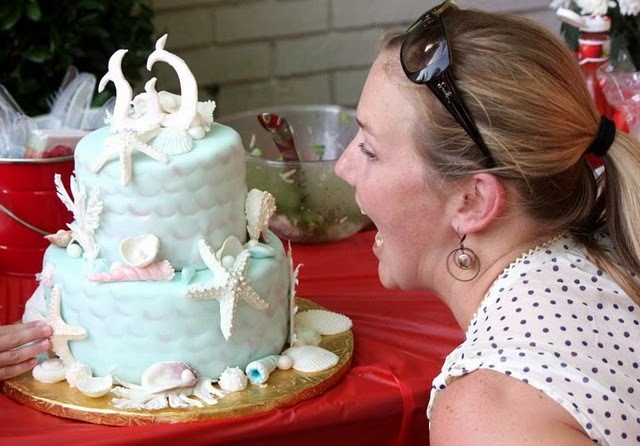 Even though the cake was for her birthday, Wendy kept joking that she was going to put it in the fridge for her upcoming wedding. I think she liked it. Especially the "W" for Wendy on top. Labels: because cjane asked me, delicious, events of the season, why do I always start crafting at 10:30PM? Oh. My. Gosh!!! I didn't realize until this minute that anything blue could look so delicious. Gorgeous cake! Trust me, CKW, me either. Blue foods are normally disgusting, aren't they? This time, it's actually appealing! And do you actually mean to say the blue fondant tasted good? Every frosting I've tasted like that has been nasty! I'd like to know how you got that stuff to taste good! i never say this ever at all, but this cake makes me want to say "SHUT UP!" it is so ridiculously incredible. What a beautiful cake! Your sea creatures look so real. I adore it! Want to make something like this by myself... now ;). 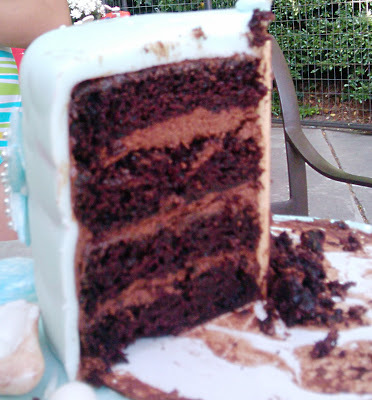 This freaking cake . . . Words, where did you go? You should hire yourself out as a cake decorator! And then you can write in your spare time. Awesome! You win! Oh, well, maybe the birthday girl wins. Either way, thanks for the post. Beautiful. Beautiful work. That is amazing! You are very talented. I am stunned. How did you learn to do this? Gorgeous, absolutely gorgeous. Holy S*$t! That cake is freaking awesome! Wow! I mean WOW! Tell me again why you don't have a food blog. Also, I completely agree -- it must not only look good, but must also taste good. You rock. It looks that beautiful AND tastes good? Wow, you rock! I follow you on Twitter more than I actually read your blog - and I guess I don't know you as well as I thought I did just from your mostly-snarky Tweets. This cake is unbelievable. Fabulous.. nothing i could actually do, maybe someday.. thanks for sharing. Holy cow lady, I had no idea how freaking talented you are. That cake is unbelievable! 1. I wasn't in town for Wendy's party. 2. So I didn't get to meet you there. 3. And I didn't get to eat some of that cake. Oh my goodness! That is the most fantastic cake I've ever seen. You have one very serious talent. I'm mostly a lurker who now mostly hates you in a mostly positive way. I mean, you're funny, you have great taste in music, you're a great writer, and then WHAT? 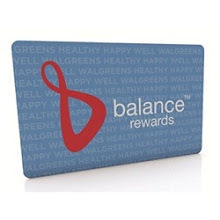 THIS TOO? That is the most gorgeous cake of all time! Wow. Gorgeous! I haven't tried making things out of gum paste yet. Do you use a standard Wilton gum paste recipe or can you buy it premade? I just love it! I ate a piece of this cake and it was divine! It's astounding. I thought, Well she must have at least used some molds. By hand, you say? From your imagination? *eyeroll* :-) Beautiful. Love the colours together. Shut your freaking face. Now I'm even more obsessed with your blog. I had no idea you could cake. I used to think I was a decent cake maker. Boooo me. Yay you. My birthday is February 15th. Holy cow, that is amazing. I can't believe you made those sea creatures, too. I totally assumed they had to be real. I love the color and the little curves all over the cake, simple and beautiful. Wish I could have tasted it, too. That came out of your brain. How did you get the texture with the frosting? Azucar - seriously. That cake. amazing. that is such a beautifully done cake and I'm amazed at the depth of your talents. truly - you are an awesome woman. Wow! That is RAD-ular! You have skills! All I can say is, thank God you don't live around here, or I'd be competing with you at all the birthday parties. And losing. That's amazing. I knew you could do cakes, but I didn't know you could DO cakes...you're a serious cake artist. Why don't you open up a bakery? Seems like your true calling...or at least be a wedding cake maker full time...seriously, why don't you? Way to go! Gorgeous shells. Although I'm not sure I would consider gumpaste edible. Just don't let most people know you do cakes. 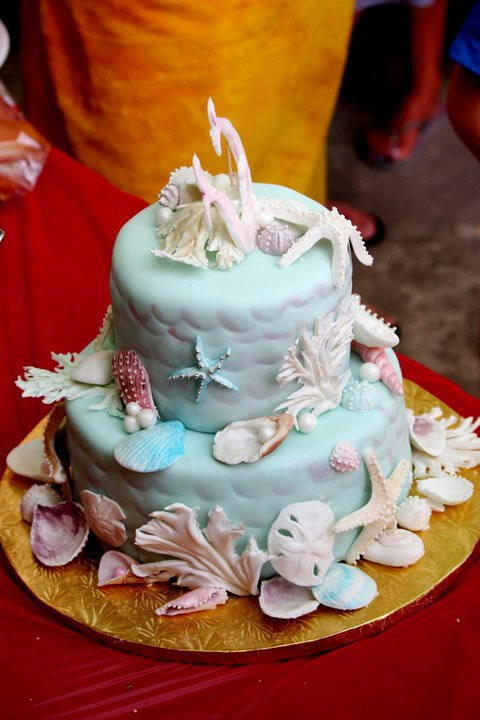 You'll get begged into doing wedding cakes and all sorts of similar crap. Let me spare you the details: wedding cakes are a ginormous pain! p.s. the kids at the party ate all the gum paste shells. I tried to warn them, but I guess the appeal of straight sugar without flavor was too much to pass up. Jennie, I've done a ton of wedding cakes in the past. These days I just tell people "NO." It's kind of easy, actually. They are a lot of work. I like doing wedding cakes, but again, a lot of work. So much work that once I inform people how much I would charge (in dollars, not yen,) they generally wander off on their own. My time is worth too much to just make a cake for anybody. Dude - that is absolutely bananas (meaning, completely amazing)! Well now I want to know what you charge, I usually pay $120 for birthday cake that feeds 15 that is not even close to amazing like this. You let me know if you ever change your mind on doing cakes. This is stunning stunning stunning. After a tweet saying how fab this cake was and how I had to come see it (via @HollyWillNot), how could I resist... All I can say is You are fabulous! Gorgeous cake! You have now trumped my breast milk AND my blood pressure. You win this round, my friend. Are you kidding me with this cake? Stunning. Wow. That is a gorgeous cake. Remind me to never invite you to one of my kids parties. That is probably one of the most beautiful cakes I have ever seen. How long did that take you to make? I feel like I'm missing something that everyone else gets. You didn't really make those sea shells, right? There's no way, you made those. Right? I think you're punking us. You know, I think it's a little mean and selfish to post a cake online like that and make us read and watch and then not be able to have any. Especially since I just went to a wedding and the cake was beautiful but I took a bite and it pretty much was crap. I love that my friends are amazing. so beautiful. you are a master! YOU ARE AMAZING!!!!!!!!!!!! I am so incredibly impressed!!!! WOW! What a talent! I linked over from CJrun just to tell you that this is one impressive cake. Maybe you need to go into business? I know in my neck of the woods people pay big $$ for that! And, dang! It looks so tasty too! I am craving chocolate cake now. I am not exaggerating when I say this is the most fabulous cake I have EVER seen. Ever. Seriously creative and gorgeous.